Campaign’s Advertiser of the Year has to meet some pretty tough criteria. This category is not just about doing great creative work, it’s also about making sure the advertising is effective, which means sales results are imperative. It’s also about being a good client, about treating your agencies with respect, working in partnership and paying a proper price for the services they deliver. This year, it was hard to find many advertisers that delivered all of these. Some had a consistently strong record of creative excellence, but were dogged by reports of poor agency management or had little evidence that the work they'd bought had significantly affected their business. Others achieved the effectiveness without the spark. Heinz, however, delivered across the board. Heinz renewed its faith in advertising this year, and was rewarded with a strong agency partnership with McCann Erickson that delivered consistently strong work and significantly improved sales results. Heinz's performance over recent years had been on the wane. Faced with a business that was underperforming, a new UK president, Doug Woodward, arrived in summer 2006 determined to change things. Together with a new chief marketing officer, Suzanne Douglas, from Australia, the pair committed to increase marketing spend by 40 per cent. They set about looking for an agency to help them do it and McCann Erickson was appointed in November 2006. Heinz, though, faced a problem. While it was still an iconic, distinctive brand and achieved a strong awareness, the world around it had changed. Not only was there serious competition from other brands and private labels, but consumers' food habits were changing. While there was a latent affection for its brands, there was still a sense that people might have forgotten how or why to use them. Heinz needed help to get itself back as a contender for the nation's taste buds. Importantly, the effects of the Jamie Oliver-inspired wave of concern about food nutrition meant it was critical to emphasise the brand's real food credentials. Yet Douglas was also keen to avoid being too worthy. She said: "The Heinz brand is a warm brand consumers love and really want to engage with. We don't need to be too serious about everything we do." So, with that approach in mind, McCann was able to get on with its first job. 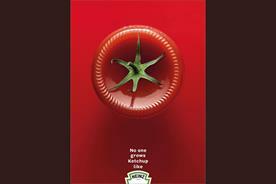 The most famous campaign it developed for Heinz was for its Tomato Ketchup. Faced with tough competition from Branston claiming a product that contained more tomatoes, Heinz turned to quality rather than quantity. Armed with the knowledge Heinz grows all of its own tomatoes, McCann developed a campaign focusing on its quality ingredients. One of the executions, "sliced bottle", picked up a gold in the Campaign Poster Awards in October. It did spark some "plagiarism" controversy, but there is no evidence that the ad's similarity to work for a Turkish ketchup brand is anything more than a coincidence. In terms of sales, the brand registered an 11 per cent increase by August 2007. Salad Cream was a brand that was suffering. Consumers increasingly regarded it as staid and synthetic, seemingly preferring the more sophisticated taste of mayonnaise or other dressings. The "pourable sunshine" TV and print work evoked optimistic and happier summer days and, similar to Ketchup, sales results were impressive - up 18 per cent. More importantly, data supplied by Millward Brown suggested 64 per cent of those asked felt that the campaign made Heinz Salad Cream more appealing. Some of the Heinz brands appear to lack relevance in today's modern, chilled-food culture. Big Soup, a canned soup that can look out of place when put against its more upmarket competitors, was supported with a print campaign that emphasised its hearty ingredients. It was able to report 17 per cent increases in value sales and penetration. As well as revitalising some of the stalwarts of the Heinz line-up, Woodward demanded innovation, all of which needed marketing support. Six new brands have been supported over the year. These include beans packaged in microwaveable snack pots, flavoured variants of Ketchup and Farmers' Market, a new range of chilled quality soups inspired by the finest British produce and supported with a TV campaign showing country scenes and animals transplanted into urban settings. Across the board, client and agency have remained faithful to the promise of real-food credentials. Snacks for children emphasised the ingredients to turn snacking into something positive. The Mum's Own range used a TV campaign that showed toddlers handing around slips of paper, which are revealed to be original recipes. A new product aimed at snacking teenagers, Big Eat, used sponsorship for Ant & Dec's Saturday Night Takeaway as well as a website that encouraged users to come up with their own ident idea. Unluckily for McCann, the agency ends the year without the client that has been instrumental in rejuvenating the image of its own creative capabilities. As a result of a perceived conflict with its global client Nestlé, the agency was forced into resigning the account. Heinz went to Abbott Mead Vickers BBDO. Overall, this award is recognition for Heinz's belief in what well-planned, single-minded creative work can do for a brand. There are few clients that have embraced creativity as passionately as Sony has over the past two years. The Fallon-created "colour like no other" campaign, which was born out of a push on Bravia LCD televisions, has wormed its way through the electronics giant's entire product range. The quality of the work backing the campaign is testament to an agency at the peak of its creative powers and a client prepared to take big risks. Three years ago, Bravia was the creative jewel in the Sony advertising crown, in 2007 it shares that position with work for Walkman, Cybershot, HD, Blu-ray and Vaio. Unfortunately, most of the campaigns broke in the last quarter of the year, so there is a lack of meaningful effectiveness data. But should the Vaio, Blu-ray and Walkman work follow the Bravia pattern, then Sony will be pushing hard for the top spot this time next year. Sky kept its new agency, WCRS, very busy creating a range of distinctive and varied work throughout the year. It began with the launch of its TV, phone and broadband package through the tactical "See, Speak, Surf" campaign, which added 1.4 million customers by September 2007. Then, in March, came the battle with Virgin Media. Sky used WCRS to produce fast-turnaround ads to sway possible turn-away viewers and to react to the ad slanging match that unfolded. Six months after battle began, Sky had gained 100,000 customers while Virgin had lost 117,200. And finally came the work that everyone had been waiting for. A host of poster and TV work emerged under the banner "Believe in Better". But the biggest improvement has come from Sky's relationship with its creative agency. Historically seen as a demanding client, Sky has shucked this attitude with WCRS, although some of its other agency relationships do not seem quite so rosy.